Chloe is a junior who has served the Adelphi SPS chapter for two years--initially as a Public Relations Officer and then currently as a Vice President. During her term as the Public Relations Officer, she helped advertise for our chapter for both majors and non-majors alike. She also helped to represent our chapter during PhysCon 2016 and attended as a reporter. 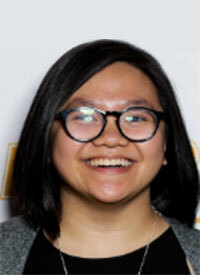 As a Vice President, she continues to support chapter advancement towards networking and outreach by setting up talks that introduce career opportunities to physics majors, meetings that incorporate exciting physics experiments, and events that are geared towards outreach to high school students and non-majors. Along with her leadership positions, she conducts undergraduate research at NYU Winthrop University Hospital. She works along side medical physicists to conduct a study about dosimetry assessment. She intends to graduate with a physics bachelors and a math minor. After her undergrad, she plans to pursue a masters in medical physics. I left my 12-year career in the federal government to learn physics and help make people's lives better. I am SPS.